I don’t know that these photos make the new grille any more appealing, there’s still the impression that the front-end is too small for the rest of the car. But then, I didn’t like the HS front grille much either until I saw it in person. Also issued was a press release about the 2010 LSh, look for that after the jump. The Lexus LS 600h L sedan, the first vehicle to bring fuel-efficient gasoline-electric hybrid technology to the prestige luxury segment, debuts revised styling and new telematics systems for 2010. The brand’s flagship model, the LS 600h L – the “L” signifying the long-wheelbase LS platform—provides the highest level of performance, technology and luxury in the LS line. The LS 600h L is powered by the ultra-quiet Lexus Hybrid Drive system, which was the world’s first to combine a V8 gasoline engine with an all-wheel-drive (AWD) hybrid drivetrain. The LS 600h L’s combined estimated EPA fuel economy rating of 21 mpg is equal to or better than the combined fuel economy ratings of some mid-sized V6 AWD luxury sedans. The 2010 LS 600h L is distinguished by a revised front grille and bumper. Rear styling is enhanced with distinctive blue-tinted taillights and a revised license plate surround and exhaust diffusers. New side mirrors integrate turn signals. Thanks to improved hybrid battery packaging and placement, the trunk capacity for the 2010 LS 600h L grows by nearly two cubic feet. New Intelligent High Beams adjust their brightness in response to oncoming vehicles. Already lauded for its comprehensive luxury, the 2010 LS 600h L gains numerous additional luxury amenities and user technology features including a driver’s seat that now features a standard slide-away feature that makes ingress/egress more comfortable; a new LCD instrument cluster; the standard Lexus Navigation system employs new casual language recognition; Bluetooth® phonebook capability and new music playing capability with USB/iPod® connectivity and Bluetooth audio streaming. Two all-new telematics products, Lexus Enform™ with Safety Connect™, are available with a complimentary one-year trial subscription. The LS 600h L hybrid powertrain system uniquely combines a 5.0-liter V8 gasoline engine with two powerful electric motors and a large-capacity battery pack. The hybrid powertrain generates a peak combined output rating of 438 horsepower and can effortlessly accelerate the LS 600h L from zero-to-60 mph in just 5.5 seconds. Mid-range acceleration is even more impressive. The system’s electric motor is capable of delivering maximum torque on demand and is most beneficial during passing maneuvers. The LS 600h L can accelerate from 50-70 mph in just 3.5 seconds. The innovative V8 features an electric motor-driven Variable Valve Timing with intelligence (VVT-i) and Electrically controlled intake cam (VVT-iE). The combination of VVT-iE and oil pressure-controlled VVT-i for the exhaust cam provides superior engine-startup operation and high-output performance. A specially developed Hydrocarbon Absorber and Catalyst System is linked to the two-way exhaust to help prevent hydrocarbons contained in the exhaust from being released into the atmosphere during cold start up when the catalysts are not up to temperature. The LS 600h L meets the Super Ultra Low Emission Vehicle II (SULEV II) certification, emitting nearly 70-percent fewer smog-forming emissions than the average new car. A state-of-the-art, full-time all-wheel drive system adapts to road surface conditions to help provide excellent vehicle control during acceleration, high-speed driving and cornering. The AWD system employs a compact, ultra-quiet transfer case equipped with a TORSEN® limited-slip differential (LSD) that is 30 percent lighter in size and weight than previous TORSEN systems. The driver can select “hybrid” (normal), “power,” or “snow” modes to change the rate of throttle opening for a given throttle-pedal angle. The “hybrid” mode provides the smoothest operation and is ideal for city or suburban driving; “power” sharpens accelerator pedal response and “snow” mode softens accelerator pedal response, making it easier to accelerate on slippery road surfaces. By pushing an EV switch, power reverts to full electric mode for short-distance, low-speed driving situations such as residential areas or parking garages. Networked with the Vehicle Dynamics Integrated Management (VDIM) system, VGRS can make minor adjustments to the front-wheel angle to help provide improved stability in challenging road conditions. The VDIM stability system incorporates and manages all of the car’s dynamic handling sub-systems, including: Electronically Controlled Brake (ECB) system, EPS, Vehicle Stability Control (VSC), Antilock Braking System (ABS), Electronic Brake-force Distribution (EBD) and engine torque via the electronically controlled throttle. Monitoring a variety of sensors, the system anticipates the onset of a vehicle skid or slide while cornering, and helps correct the situation with a combination of braking, throttle and steering control in a way that is essentially transparent to the driver. VSC can be turned off for particular circumstances via the Trac Off button. In addition to the active safety features, the LS 600h L is standard-equipped with eight airbags, with a maximum of 11 airbags available through option packages. The world’s first low-beam LED headlamps provide superior road illumination, and the standard Adaptive Front lighting System (AFS) helps to illuminate a turn or curve as the driver steers into it. The available Advanced Pre-Collision System (APCS) was the world’s first system designed to help detect pedestrians in the vehicle’s path when it debuted on the 2009 Pebble Beach® Edition LS 600h L. This system is now available for the 2010 LS 600h L (and the LS 460 models) with Lane Keep Assist. Using two small cameras mounted at the front of the car that work in conjunction with millimeter-wave radar, APCS is sensitive enough to detect certain nonmetallic objects. As part of APCS, the LS also offers the Driver Monitor System, which was another world first. A third camera, mounted on the steering column, monitors the orientation of the driver’s face. The LS 600h L is based on the long-wheelbase LS chassis, providing nearly five inches more legroom than the standard LS 460 model. 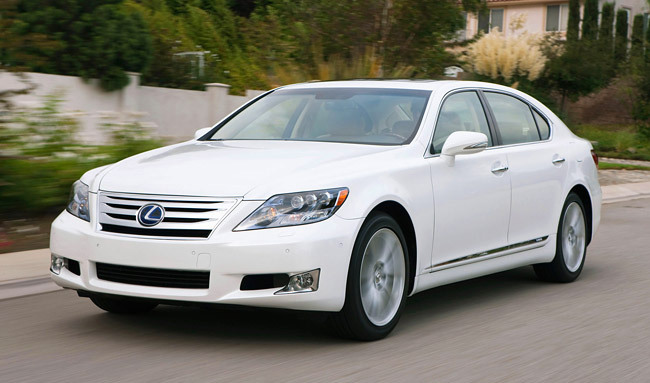 This flagship sedan provides the highest level of comfort and convenience features in the LS series. Standard features include a hard disk drive (HDD) Lexus Navigation system with a backup camera, Bluetooth technology, Voice Command casual language voice-recognition system, plus an integrated XM® Satellite Radio receiver. For theater-level entertainment, the LS 600h L features a standard 19-speaker 450-watt Mark Levinson® Reference Surround Sound audio system. An auxiliary jack located in the front center console allows for MP3 digital music players while a USB port allows for iPod connectivity. Additional standard features include climate-controlled front seats, heated rear seats, a heated steering wheel, power rear sunshade, one-touch open/close power trunk, power door closers, headlamp washers, SmartAccess with push-button start and card key, electronic parking brake, Intuitive Park Assist, and laminated side glass. New standard features for 2010 include the Cold Weather Package, which includes a windshield de-icer, upgraded battery and more efficient heater, and the Advanced Parking Guidance System (APGS). APGS is designed to assist with parallel and back-in parking. Once the driver has correctly positioned the car and identified the desired parking spot via the navigation screen, APGS utilizes the rear back-up camera parking sonar sensors and electric power steering system to guide the car into the space, while the driver controls speed via braking. The Premium Package II includes two new additions for 2010, butterfly rear headrests and left rear seat with lumbar massage. The package also features rear climate controlled power seats with memory and power headrests, rear seat-mounted side airbags, a rear heater control panel, four-zone climate control, rear audio controls, additional wood trim, rear air purifier, rear headliner and side air ducts, power rear-door sunshades, and a rear seat entertainment system equipped with a power ceiling-mounted nine-inch screen for DVD viewing. The Executive Class Seating Package II includes all features in the Premium Package II and adds a power right rear seat with ottoman. The seat reclines up to 45 degrees with an upper-back recliner featuring a 17-degree angle adjustment. A multi-function massage feature for the right-rear seat recliner can be used separately or in conjunction with the seat heater and cooler. The LS 600h L flagship hybrid luxury sedan showcases the brand’s L-finesse design philosophy, revealing a family resemblance that conveys elegance, refinement and a strong emotional appeal. Minimal body gaps, a low front grille and deep-drawn fenders all contribute to the car’s distinctive, muscular profile. Lexus’ attention to detail is seen in the integrated dual chrome exhaust tips and the one-piece chrome window surround. Projector-type headlamps with blue crystal rings, which introduced the world’s first nighttime LED low beams, provide excellent visibility and contribute to the design theme. Blue accents on the headlamps, badging, engine cover and the SmartAccess key fobs and Smart Card key are unique to the LS 600h L – as are the blue-tinted taillamps added for 2010. The Lexus LS 600h L offers an all-new telematics system, Lexus Enform™ with Safety Connect™, available by subscription. Complimentary one-year trial subscriptions are included on all purchases of new Lexus vehicles equipped with these features. Both the Lexus Enform and the Safety Connect response center operate 24 hours a day, 7 days a week—every day of the year. Safety Connect, the cornerstone of the services, is standard on LS 600h L and offers four safety and security features: Automatic Collision Notification, Stolen Vehicle Location, Emergency Assistance Button (SOS), and Enhanced Roadside Assistance, which adds GPS data to the already included warranty-based Lexus roadside service.